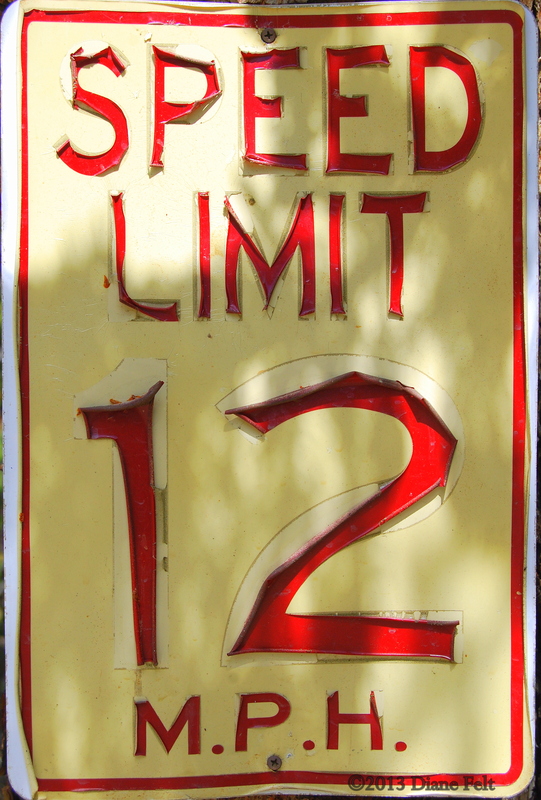 What does 12mph and Speed of Sanity mean? A 12 m.p.h. sign near the Chief Mountain Trailhead in Colorado. Life happened the last seven weeks since our last post. A childhood friend passed away on February 7, so Diane drove back to Iowa to be present for her memorial service. This week-long trip also provided time for Diane to spend with Iowa family. Fast forward to March 1 and Steve retired. Then during the weeks leading up to now, we’ve been steeped in researching used pickup trucks, used travel trailers, pickup bed toppers, virtual mailbox services, and travel trailer insurance. We’re gradually going paperless between scanning, shredding, and making sure we receive important account information via email or by logging into accounts. And, we did purchase a used pickup two weeks ago. This week we ordered the pickup bed topper and signed up for Traveling Mailbox (our virtual mailbox). Today brought another donation run to ARC Thrift Store as we continue to downsize our household. The pace has been almost daunting, which brings us to the Speed of Sanity! People have asked us, “Why 12mph and why Speed of Sanity?” Well, 12mph was the average pace that Steve anticipated for his bicycle ride across the U.S. in 2005. 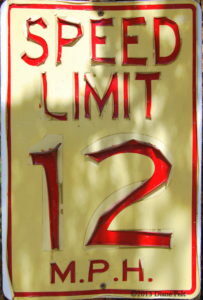 He coined our blog then as “12mph….America at the Speed of Sanity.” With the passage of time and the shifting in lifestyle, we are coining this next journey of our lives as “Life at the Speed of Sanity.” Yes, we will do some bicycle riding, but of course we won’t be driving the truck at 12mph! (To read the entries related to our 2005 summer, go to Categories and 2005 Bike Trip). The online Oxford dictionary defines sanity as “The ability to think and behave in a normal and rational manner; sound mental health,” and “Reasonable and rational behaviour.” Did you know the term ‘sanity’ is outdated in the field of mental health? Our first step in our own journey to ‘sanity’ is throwing off the expectations of the culture in which we live. For us, sanity is atypical and recognizes that we are not only rational, but relational and emotional humans. We are intentionally shifting to a lifestyle for us with a measurably slower pace, much like the 2005 summer. Likely, many people would agree that the pace at which we live, acquire or receive information, work, transport, shop, and communicate is frequently intense and rapid. A gentleman in our neighborhood mentioned last fall as he visited our yard sale, “Denver is hyper anymore between the traffic, the noise, the exhaust fumes, the rudeness. I’ve been here 20 years and have no intention of retiring here.” We are exhausted at the end of our days. Yesterday we sat over breakfast to consider what we mean by “Life at the Speed of Sanity.” Slow down. Enjoy the surroundings. Savor time with family and friends. Be open for serendipity to surprise us. Appreciate spontaneity. Be flexible. Push away from a hyper environment. There are opportunities for us all the time and around us everywhere, but we zip right past them due to the pace of the world. We anticipate witnessing kindness and civility along the way. (These were both experienced in 2005). Over the past 13 years, we’ve shifted our mindset to embrace the relationships in life, not the stuff. While not intent on becoming full-fledged minimalists, we are using the concept to help guide us. Having the stuff out of the way, opens us to possibilities of engaging with others, nature, beauty, and our Creator. After all, what good is the journey if you know the destination?